Ever feel like your songs are missing something? Use these 6 tips to make the most out of your studio time and capture everything needed to make your tracks standout. The brief moments that precede and follow recorded audio takes can be packed with valuable content. A drummer sits on the throne and picks up her sticks, gently shutting the hats before giving the four-count. Band members converse excitedly as they enter the tracking room. The prospect of recording your music is exhilarating, and that energy might translate to tape. A live track’s conclusion is no different. Band members can’t help but laugh at how hard they just rocked. A dead-serious frontman sighs “That’s the one” after baring his soul on a lead vocal track. Not to mention, capturing your surroundings is a great way to establish the kind of atmosphere or energy you want your track to embody. For a lot of people, especially the die-hard fans, an artist revealing their personality is a special gift. By injecting a little humanity into your studio tracks, you can circumvent the sterile fourth wall that separates you from your audience. Everybody’s process is different these days. But one constant across the spectrum of production routines is the use of digital audio processing. MIDI is completely non-destructive, giving you total control over your performance. Plug-ins are sounding better every day, and they’re much cheaper than their hardware counterparts. It’s easy to digitally produce a track, but you may find that something is missing when you listen back. And the answer is organic audio. If you’re shaking your head, thinking there’s no way you could afford the studio time or equipment, stop doing that. It doesn’t take much to infuse a little realness. Chances are you already have a microphone, so add real claps and stomps. Gabriel only used a computer to layer the 25 overdubs that build the claps & stomps of “6 8″, everything else was recorded directly to 2” tape. His track later got sampled on Drake’s track Jungle, one of his biggest songs to date. If you’re running an efficient session, you know what needs to be captured and you do so methodically. Once you’ve got everything you need from your vocal or instrumental, create a new track and ditch the script. This is a time for the musician to have fun and do what comes naturally. Tracking ad-libs will surely improve the quality of your pop or hip-hop vocal. Allowing your guitarist to jam on the track could result in a fresh lick that drives the hook. Stimulate these vocal or instrumental fragments further by dropping them into Arcade and using its simple modulation engine to transform a sample into something extraordinary. Inspired moments like this, where anything can happen, are what take productions to the next level. We’ve stressed the importance of organic elements, but let’s be honest. If it weren’t for 1’s and 0’s, modern music as we know it wouldn’t exist. The elements that set you apart in today’s scene will almost certainly require the use of a computer, whether it’s a software instrument or a glossy mix. Output focuses on instruments and plug-ins that challenge the standing ideologies of artists and producers. From the award-winning Rev to Analog Brass & Winds, our software puts a unique spin on familiar sounds, programmed to facilitate effortless modulation. 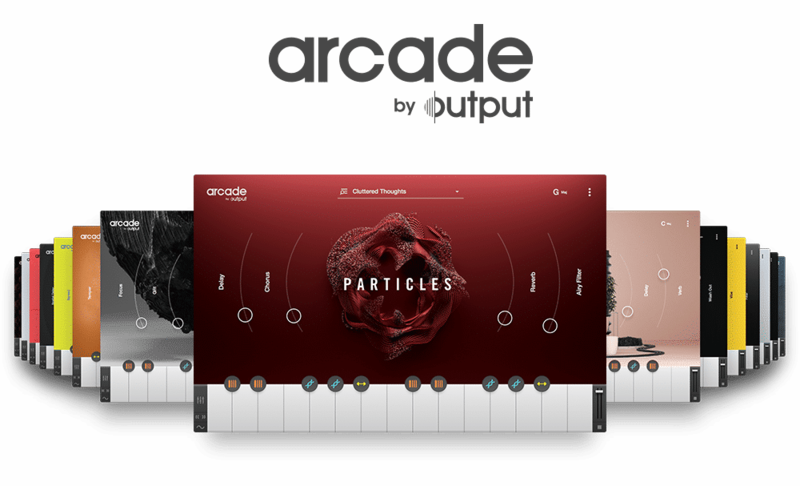 Tweak some knobs, combine strange textures, or drop in your own samples and let Arcade do the work! Sound familiar? Believe it or not, toiling alone in your cave with the curtains drawn for weeks on end will not yield optimal results. Falling into the trap of “I can do it myself” not only limits your resources, but it’s also rather unhealthy for the mind and spirit. Collaboration starts as a seed before blossoming into a full-on rain forest. On the most basic level, working with other minds will expand the possibilities of what your song can become. The right element to revitalize your track could come from anywhere at any moment, and being open to such an occurrence is paramount. On a broader scale, every positive collaborative experience will lead you to a larger network and, ultimately, more opportunities to work with inspirational artists. Community begets music, so engage yourself with your surroundings and witness real, human magic. The oldest trick in the book. Once you’ve got the perfect take, especially after straining for hours to do so, you may be tempted to say “got it” before slamming your laptop shut (after saving the project) and heading to Denny’s. After all, they do have delicious all-day breakfast at affordable prices. You may think capturing the take you’ve been after is the knockout punch, but it’s more like your opponent leaving himself open for an uppercut. Once you’ve got a good take, the shackles of a high-pressure recording environment are broken, and your musician can breathe the sweet air of relief. Use this opportunity to get one or two more takes. When “messing up” is no longer a complete failure, an artist can really let go and, more often than not, cut a performance that’s far beyond what you’d imagined.